1. IBM AT , PS/2 compatible. 3. Built-in Touch-Pad for Pointing input device. 4. Glide your finger to move the cursor. 5. No contact force is required. 6. Use the buttons like mouse buttons. 7. Tracking speed up to 40 inches per second. 8. Elegant Wrist-Rest for a comfortable support and rest. 9. Easy Internet key as shortcut to your E-world. The condense and industrial sized easy touch keyboard includes a built-in Glidepoint Touchpad and it has a compact 1U design for standard industrial applications. 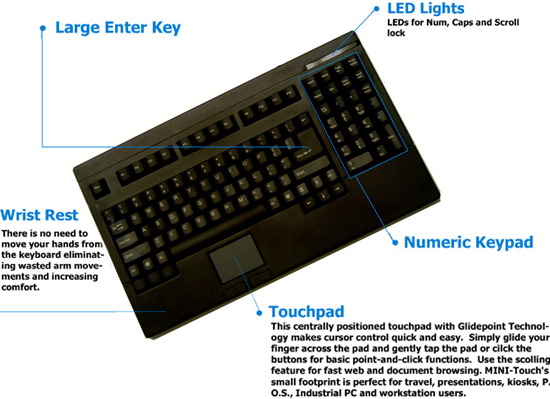 This Industrial keyboards are designed according to EIA-RS-310C specification. It can be mounted to a rack mount drawer or have the combined keyboard and drawer which is the ACK-730PB-MRP. This PC keyboards offers a flexible selection of full-size keyboards to meet any industrial environment requirements. 15.75" x 9.25" x 1.34"